Your body continually requires a wide range of nutrients to maintain optimal function. Providing it with sufficient levels of macronutrients such as omega 3s remains just as important as ongoing nourishment with micronutrients such as vitamin D. Although you may find both in some foods, they have very different roles in the body. Dr. Joseph Mercola, the Illinois-based physician and the author of “The No-Grain Diet,” points to vitamin D as one of the most important nutrients in human nutrition. He explains how it supports bone health, improves immune system function, boosts mood and can significantly reduce cancer risk. Specialized cells in the skin can produce vitamin D following exposure to bright sunshine but, this source of vitamin D may not be provide all the body needs, particularly during the darker winter months. As a result, women may need vitamin D supplements. Udo Erasmus, PhD, describes omega 3s as essential fats, which means the body cannot make them. Instead, they must come from the diet. In his book “Fats that Heal, Fats that Kill,” he explains that every cell in the body requires these oils to manufacture healthy membranes. Omega 3s also help reduce inflammation, improve circulation and boost metabolism. They may also help reduce the risk of cardiovascular disease. Vitamin D exists in two forms in the diet. You will find vitamin D-2, also known as ergocalciferol, in mushrooms exposed to UV light. Vitamin D-3, also known as cholecalciferol, can be found in foods such as eggs, oily fish and fortified dairy products. Source of omega 3s include flax seed, walnuts, pumpkin seeds and oily fish. 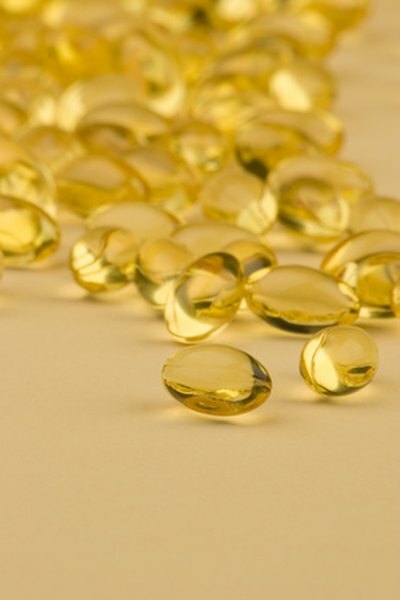 Cod liver oil stands out as a concentrated source of both vitamin D and omega 3 fats. Often used as a remedy for vitamin D deficiency in Scandinavian countries, cod liver oil delivers an impressive 1,360 international units vitamin D per teaspoon, Gayla and John Kirschmann note in their book “The Nutrition Almanac.” that . Additionally, the same 5 g serving of oil provides around 1.5 g of omega 3 oils. So, while omega 3s and vitamin D remain entirely separate nutrients, they may occasionally come in the same product. Dr. Mercola highlights vitamin D deficiency as an extremely widespread problem across the nation. He notes that the rate of the deficiency increases during the winter months, and advises individuals to take around 5,000 international units of vitamin D per day and around five grams of fish oils in separate products. “The Nutrition Almanac”; Gayla and John Kirschmann; 1996. “Fats that Heal, Fats that Kill”; Udo Erasmus PhD; 1986.